Up to now our series on people who were regarded as “crackpots” but who turned out to be right has not included any mathematicians. That is because most issues in mathematics can be resolved quite quickly. The logic of a claimed proof can normally be checked and either verified or debunked beyond doubt by examining its logic. 1545: Gerolamo Cardano introduced imaginary numbers which were further developed by his disciple Rafaello Bombelli, but they were not widely accepted until the work of Leonhard Euler in the eighteenth century. 1830: Nikolai Lobachevsky introduced hyperbolic geometry which was an early example of non-euclidean geometry, but his work was rejected by the St. Petersburg Academy of Sciences. Gauss and Bolyai had similar ideas at the same time but it was not until later when Riemann introduced more general non-euclidean geometries that the validity of the work started to be accepted. 1852: Ludwig Schläfli classified the six regular polytopes in four dimensions but his manuscript was rejected by the Austrian Academy of Sciences and then by the Berlin Academy of Sciences and was not published in full until after his death. 1873: Georg Cantor analysed transfinite numbers but his work was opposed by a number of mathematicians who believed that such entities do not exist. Leopold Kronecker was especially critical and prevented publication of the work in Crelle’s Journal. 1888: David Hilbert’s proof of his basis theorem was heavily criticised for being non-constructive. Paul Gordan who had originated the problem was particularly unimpressed and refused to accept the solution. 1945: When Saunders MacLane and Samuel Eilenberg tried to publish their seminal work on category theory it was at first rejected as being devoid of content. Some of these examples could be justified as cases of “crackpots” who were right, and there are others, but a more striking story is that of Roger Apéry. His mathematics was initially rejected, not because it was too abstract, but rather because his colleagues would not believe that it could be right. Roger Apéry was a Greek-French mathematician born in 1916. As a working mathematician in France he took a rebellious political and philosophical position that was not liked by his contemporaries. When he was asked to join the Bourbaki team who were famously compiling an encyclopedia of mathematics under the pseudonym, Apéry declined because he saw mathematics as a more individual pursuit. This led to his isolation from French mathematicians. At the age of 61 Apéry was an undistinguished mathematician suffering from the dislike of his colleagues and his own problems with alcoholism. At such a late age mathematicians are not normally expected to produce ground breaking results so it is easy to understand the level of skepticism that greeted his announcement of a proof that the number ζ(3) is irrational. The incredulity heightened when it was seen that the method of proof was very basic and used methods that could have been understood by mathematicians such as Euler who died nearly 200 years earlier. Many claimed proofs of old problems are rejected today at a glance simply because an experienced mathematician “knows” that methods that are too elementary can not solve the problem. All such avenues should have been explored before. In 1978 he presented a lecture on his proof at the Journées Arithmétiques de Marseille which was greeted with doubt and disbelief. Each step he wrote on the blackboard appeared to be a remarkable identity that his audience considered unlikely to be true. When someone asked him “where do these identities come from?” he replied “They grow in my garden.” obviuosly this did not boost anyone’s confidence. Nevertheless, a few mathematicians recognised that there was something significant in the proposed proof. They checked the identities numerically and found that they did indeed seem to hold. It was not long before the full validity of Apéry’s work was confirmed and the skeptics were forced to eat their words. 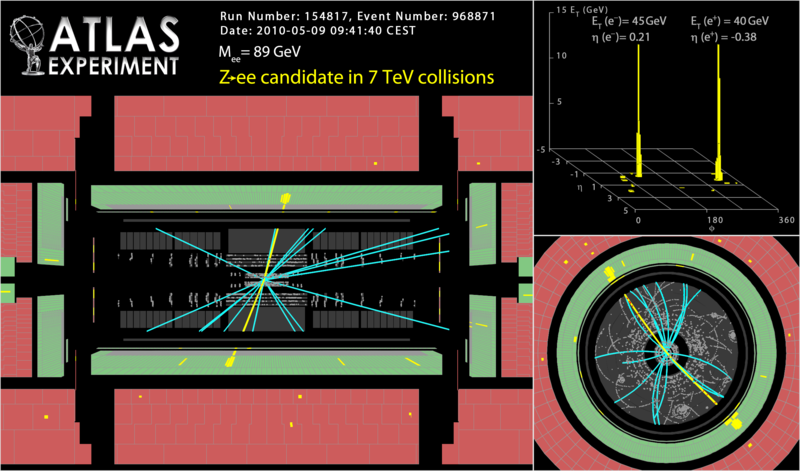 The rediscovery of physics at the LHC progresses with ATLAS showing the first candidate events for the Z-boson. These were first discovered in 1983 at CERN using the smaller SPS collider which now serves as the injection ring for the LHC. ATLAS and the other LHC experiments have been seeing plenty of Z-bosons but we outsiders have to wait for them to approve the reports before we can see them. The next physics milestone will be observations of the top quark which was discovered at the Tevatron in 1995. Peak luminosity in ATLAS is currently 7.7 x 1027 cm-2s-1. Over the next few weeks they plan to increase this in a series of doubling steps. The process has been going very smoothly thanks to the good performance of the magnets and cryogenics. The plot below using a log scale shows how the integrated luminosity has been increasing exponentially with a thousand factor improvement in less than two months. 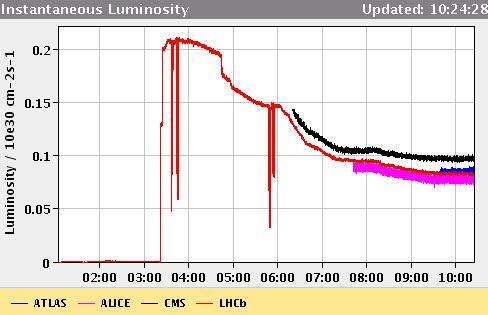 The LHC controllers will want to see this trend continuing until luminosity is reached at about 10000 times current levels towards the end of the summer. One of the main bottlenecks holding up faster progress is the need to train the shift staff that control the LHC so that they all know how to deal with any issues that have been found. Three weeks ago we reported that the LHC had achieved a record luminosity by squeezing the proton beams to get a factor of 10 improvement. Now they have upped the numbers once again to get a theoretical increase by a further factor of about three. 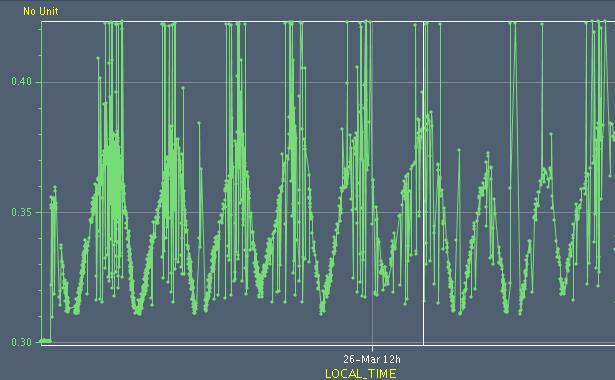 The new configuration is 3.5TeV/2m/20Billion/4-bunches compared to the previous 3.5TeV/2m/12Billion/3-bunches. Increasing the number of bunches normally increases the luminosity but it depends on how the bunches are organised in buckets to make them collide at the right points of the collider ring. The new arrangement is bucket numbers (1,3231,21081,26731) for beam 1 and (1,12141,17791,26731) for beam 2. Bunches in the same bucket number of both beams will collide in the CMS and ATLAS experiments so from these numbers you get 2 collisions per turn. 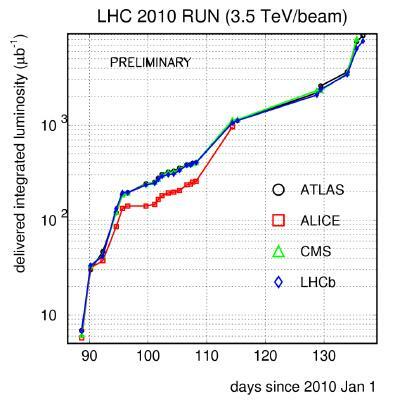 The other numbers provide the same collisions rates for the other two points where LHCb and ALICE are situated. In fact these bucket numbers are providing the same number of collisions as the previous 3-bunch configuration so for now this is not providing an increase in luminosity. However they have also increased the intensity of the beams from 12 billion to about 20 billion protons por bunch. This gives a theoretical increase in luminosity of about 3 times. The actual figure will depend on factors such as how much the beam spreads out and how well they can be aimed at each other in the collision points. The plan is to increase to 6 bunches per beam in the next few days. Depending on the buckets they use this could provide 4 collisions per turn which means another doubling of the luminosity. At the same time they have been doing test runs at much higher intensities of 100 billion protons per bunch but so far this has not been used in combination with multiple bunches and squeezed beams. This means much improved luminosities should be possible soon. What does this mean for the physics? With the luminosities they have been running at so far they have already announced observations of W bosons and bottom quarks. They must have already seen Z bosons too which are more rare and perhaps they will have seen some top quarks. It takes time for them to review and approve any announcements so we have not heard much about that yet. All of these particles are well-known and are routinely produced in large numbers at the Tevatron in the US. The LHC needs to keep improving its luminosities so that it has enough collisions to see new particles that are only produced very rarely. Of course they are also using energies three times higher than the Tevatron which means they could see new heavier particles that the Tevatron could never produce. Update Saturday Morning: They have just succeeded in ramping “nominal bunches” to 3.5 TeV. This means bunches with 100 billion protons which is 5 times the number used in the latest physics runs. This is exciting because luminosity is increased by the square of this number. In fact if they used nominal bunches on a physics run right now they could have a new luminosity record even without the squeezing and multiple bunches. On this occassion they lost 40% of the beams during ramping due to “excitation of synchrotron sidebands” but it was still a good step forward. It seems that using such high intensities can lead to problems with instabilities and beam spreading, but they nearly have it cracked. Looking forward to seeing physics with squeezed nominal bunches, hope that is not too far off now. Update Saturday Afternoon: After the nominal intensity run of the morning they started a 6 bunch physics run with configuration 3.5TeV/2m/20Billion/6-bunches. The fill pattern provides 3 collisions per turn in each experiment. It would have been possible to get 4 collisions per turn with six bunches but it looks like they are now opting for schemes that avoid displaced collisions. These are collisions that happen 11.5 m away from the collision point of one of the experiments and these are impossible to avoid in the more efficient filling schemes. In any case the injection and ramp for this fill went very well with no sharp beam losses. The run is still continuing after 18 hours and by now they must have doubled the total integrated luminosity of the LHC. Highest luminosities have now been reported as 60 · 1027 cm-2s-1 which is double the previous record from last week and 6 times the earlier record. It is also 60 times the earlier runs before they squeezed the beams a few weeks back. The LHC is now only a factor of 6000 behind the peak luminosities seen at the Tevatron. They can make up another factor of 25 if they use the nominal intensity bunches that they tested in the morning. The rest of the factor can be made up by increasing the number of bunches in the fill. They also have the option to further squeeze the beams down to the nominal beta of 0.5m rather than the current 2.0m. This would give another factor of four. In 1930 astronomers studied the heavens using only optical telescopes. Today things are very different and we now know that electromagnetic waves of different wavelengths from radio waves up to gamma rays are radiated by stars and other cosmic bodies, so we use a range of telescopes covering the whole spectrum. This change was instigated in 1931, not by a professional astronomer, but by an amateur and it took twenty years before the academics took notice. 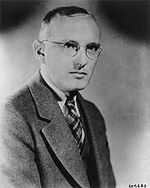 Karl Jansky was a young radio engineer working for the Bell Telephone Labs who was tasked to look for sources of radio interference so that they could be eliminated from communication equipment. Jansky built a circular radio antenna some 30 meters in diameter that could be rotated on a platform and designed to pick up radio signals at 20 MHz. After some months he had identified different types of radio static including some that he understood to come from distant lightning storms, but another source was more enigmatic. He noticed that it repeated on a cycle of 23 hours and 56 minutes, the length of the sidereal day. This meant that it was coming from a fixed point against the stars and with more investigation he found that the strongest signal came from the centre of our galaxy. The Great Depression was followed by World War II during which pure scientific research was put on hold while scientists contributed to the war effort. During that time another amateur engineer took up the cause of radio astronomy. Grote Reber built an impressive radio telescope dish in his back yard in 1937. He confirmed Jansky’s observations and drew up detailed contour maps of the signal strength which he published in the Astrophysical Journal. Wanting to persue his research further, Jansky applied for a teaching post at Iowa State University hoping to make use of their facilities. Sadly however he was struck by illness and could not fulfill his dreams. He died in 1950 without seeing how important his pioneering research was about to become. There were several reasons why it took so long for the importance of Jansky’s discovery to be recognised. The economic hardship and political unrest played its part, but in addition to that astronomers simply did not believe that the galaxy could be such a strong emitter of radio waves. This was not an observation they were willing to accept from amateurs at a time when professionals were concentrating on the revolutionary discoveries being made using optical instruments. After the war radio astronomy gradually started to take off. In the US, John Krauss founded a radio observatory at Ohio State University, but it was Europe that took the first major lead. Bernard Lovell used equipment left over from the war to start a major project at Jodrell Bank in the UK. By 1957 he had built the giant radio dish 76 meters in diameter that would go on to revolutionise our knowledge of radio-active galaxies and the distant universe. Karl Jansky did not live long enough to be honoured in his lifetime but posthumously he is accorded one of sciences most enduring forms of recognition. The metric unit for measuring the strength of radio sources is named the Jansky. You are currently browsing the viXra log blog archives for May, 2010.